Adequan Canine (for dogs) is used to control symptoms associated with degenerative or traumatic arthritis. Adequan Canine (for dogs) is used to control symptoms associated with degenerative or traumatic arthritis. Adequan requires a prescription from your veterinarian. A syringe is needed, but not included in the package. Please see 3cc (3ml) luer lock syringe with 3/4" 25 g Needle. Adequan is a prescription medication used in dogs to control signs associated with degenerative or traumatic arthritis. 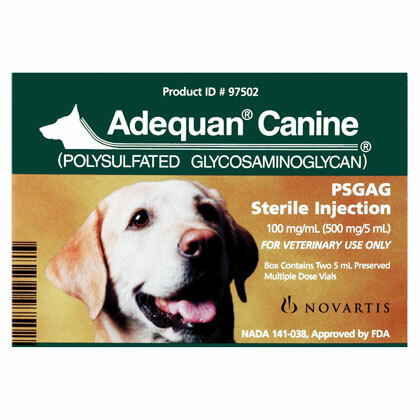 Adequan Canine 100mg/ml is available by prescription in a box containing 2 x 5 ml vials. The usual dose in dogs is 2mg per lb given by intramuscular injection only, twice a week for up to 4 weeks. Do not mix this medication with other drugs or chemicals.